I recently received word that a young woman I had attended college with at Principia passed away. I don’t know the circumstances of her passing and it is unlikely that I’ll ever know. She was a year older than I, and while we were never close friends, her death impacted me greatly: she was a Christian Scientist and mother of three young children (seven and under). Growing up, most of my friends had two-parent households, there was the occasional step-parent, or parent who traveled often for work, but there were usually two parents in some capacity. I had one friend and one acquaintance who had lost parents: one a father to a fatal heart attack, the other a mother to cancer. They were The Exceptions. They continued to be “The Exceptions” well into my final years of high school, when a woman in my parent’s Christian Science church – a mother of middle-school-aged children passed away after a prolonged struggle with cancer. I can’t say I paid much attention, people occasionally passed away at my parents church, but it was usually older people. I didn’t know the girls particularly well, and at the time I didn’t think much of it. It was part way through my time at Principia that I started to realize how many young women had grown up with out a mother. It went from “The Exceptions” and the girls at church to a dozen or more people (that I was aware of) who had lost their mother, often during their teenage years. What really drove this point home was an experience I had on a Principia Abroad. It was a small group, only about twelve students, and part way through our first week (out of a ten week quarter), one of the young women, a freshman, received word her mother had passed on. Of the twelve of us, there were two other students who had also lost a mother, counting the young woman who had just received word, there were three. Some simple math: 3 out of 12 students is 1/4 or 25%. Twenty-five percent of the students on the Abroad had lost their mother. Principia Abroads claim to be a fair representation of students on campus, and while I’m not sure 1/4 of all students were motherless by the time they reached Principia, the number (anecdotal or not) is still large enough that it should not be ignored. The passing of my college acquaintance left me feeling gutted. She came from a strong Christian Science background, had a large supportive, multi-generational Christian Science family, and she and her husband had moved closer to Principia so their children could attend the Lower School. Although it is highly unlikely I would have ever taken such a Christian Science-centric path (there is no way I’d move to the Saint Louis area), our children were similar in age, and we occasionally swapped parenting stories. I went to Sunday School with her cousins. I keep having a nagging feeling that it could’ve been me. Young men pass on too soon as well, but I found the number of young mothers who had passed away to be staggering. Malaria and thyroid cancer are largely speculative, as, in good Christian Science fashion, no one ever came out and said what happened. Drowning, however, is harder to explain away. “Young” in this case means under 40 years old for the mother, and under 10 years old for the children. Actually, hearing about a similar recent case (I really hope it IS the same case and there wasn’t another young mother with three children who died) is what made me extra angry about CS and made me want to search for other former CSers. I didn’t know this girl well but I think we played a sport or two together at the upper school. I don’t know the circumstances (since as you said it’s all hush hush) just heard that it happened recently after the birth of her third. If she did choose CS over staying alive for her kids THAT pisses me off. It’s just so so sad and in so many cases, so so preventable! Those poor kids :(. It seems likely that it was the same case, the Principia community is small. 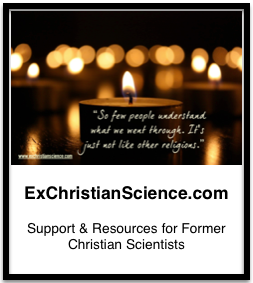 If you’re not a member already, there is a facebook group for ex-christian scientists, we’d be happy to have you join us. I have already and I like it a lot. I’ve commented a couple time but haven’t made my own post yet. Thanks for recommending it!